I am afraid for you ...."
What are the things upon which your thoughts are focused? Are you a religious 'thinker' or are your thoughts concentrated on Christ? How easy it is to rely on denominational type doctrine for our spiritual thoughts, How undemanding to rest your eternal future on your own spiritual knowledge. How facile to rest your spiritual growth on a reservoir of religious facts, How easy to consider .. sanctification rests on the accumulation of past bible studies. But this type of thinking causes a spiritual stupor to descend upon an individual. This type of thinking causes men to drift into a deep, spiritual sleep. The one that is devoted to doctrinal type thinking, has no need to think, and one that considers their own spirituality is sufficient, is sorely deceived. It is not more knowledge that is required - but a deeper concentration on Christ. It is not more spiritual activity that is needed - but Christo-Centric Concentration. "Wake up!!" "Be watchful, and strengthen the things which remain" Rev.3:2 "Repent!!" "Remember therefore from whence thou art fallen." Rev.2:5 Rouse yourself and get eyeball to eyeball with the cross of Christ, There is no greater need than to truly and fully understand the meaning of the cross. Oswald Chambers puts it this way:- "a devotee to doctrine does not need to 'think', but a man who is devoted to Christ is obliged to think, and to think every day of his life. He must allow nothing to dissipate his thinking. It is not courage that men lack today, but concentration on Jesus. We have to get out of our laziness and indifference and excuses, and rouse ourselves to face up to the cross of Christ." We must return to a place where we are prepared to expose our inner souls to Christ. We must invite Him to examine the inner recesses of our ignoble, rebellious hearts. We must allow Him to remove every semblance of 'self' from the throne of our lives. We must permit Him to expose each deeply hidden, mortifying memory. Humble yourselves therefore under the mighty hand of God, that he may exalt you in due time." 1Peter 5:6. 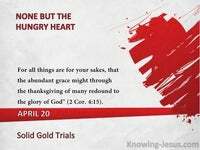 We must allow Him to humble our hearts before His throne of grace. 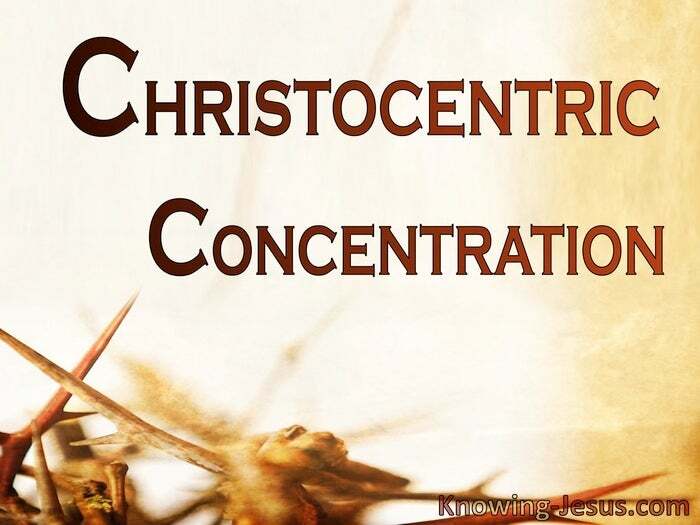 Christo-Centric concentration is the most difficult thing to achieve for a christian, for concerted, concentration upon Christ, means magnified mortification of me! 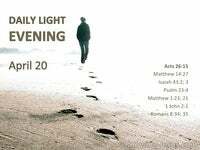 Understanding and appropriating the facts of the cross is a saint's most trying time, but "deep calleth unto deep," and there is no other way to achieve a reality of Him. But Calvary is the secret. Satan's satanic strategy is to destroy man's relationship with the Lord. He can't remove our eternal security for that is set, secure in Christ.... but he seeks to damage our relationship with Christ. And satan, that old serpent, the devil, the accuser of the believer. Satan has his favourite strategies to secure our downfall and complete our shipwreck. Satan usually uses the flesh, the old sin-nature, self.. "I" the old Adam, who is a usurper. But we must be prepared for Him to bring us to an absolute, end of ourselves. We must be prepared for Him to press us to the depths of our own despair. You must be prepared to be utterly, completely and totally broken before Him, and He will lift you up into newness of your life in Him with His own life in you. He may not send you a shining angel with tidings of great joy. He may not drop manna from heaven, nor supernaturally unlock your prison bars, but He may speak through a donkey, or He may speak through a friend. We may not be specifically instructed by a prophet to wash in the Jordan seven times, but He requires us to submit to the Spirit's inner searchings and His refining tools. All semblance of self must be removed, if He is to take up proper residence within. 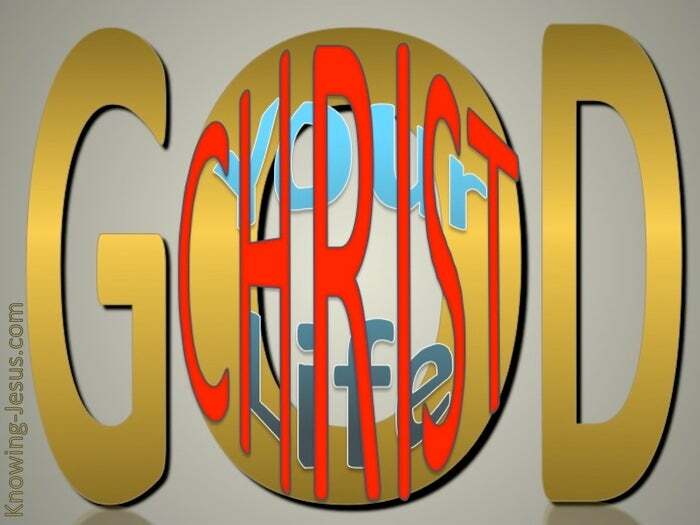 Usher put it this way: "The believer can never overcome the old man even by the power of the new, apart from the death of Christ, and therefore the death of Christ unto sin is indispensable. And unless the Cross is made the basis upon which he overcomes the old man, he only drops into another form of morality: in other words, he is seeking by self-effort to overcome self, and struggle is hopeless." Ian Thomas also said: "I must recognise the enemy within the camp - the flesh.. the old nature.. self.. I.. the old Adam. And I must recognise the enemy is a usurper. 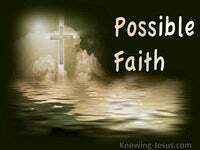 By faith I must reckon him to be put in the place that God put him crucified with Christ. 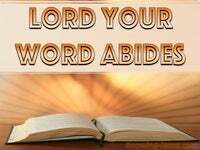 I must now realise that my life is hid with Christ in God: that He is my life"